A child of back-to-the-land hippies, I grew up in Idaho and Washington State. I went to University of Washington in Seattle where I majored in Biology and English. I’ve had many odd jobs including: assassin bug handler, book editor, media projectionist, hamster oocyte collector, free-lance journalist, and most recently, University professor at the University of San Francisco, where I teach classes about urban farming and writing. I studied under Michael Pollan at Berkeley’s Graduate School of Journalism for two years. These days I mostly write books. I’m the author of the national best selling memoir, Farm City: the Education of an Urban Farmer (Penguin)–a book about my adventures in urban farming in Oakland, CA. 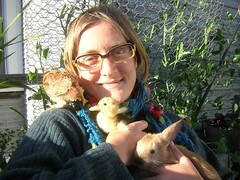 I co-authored The Essential Urban Farmer with Willow Rosenthal. Most recently, a family memoir, Gone Feral, was published in 2014. My urban farm, Ghosttown Farm, currently hosts bees, chickens, and 36 fruit trees. Pingback: Learning To Eat » Archivio » Simple. I read your story in SFGate and found it fascinating that you are able to do so much farming near downtown Oakland. Are you doing all of tis on a city lot ?…I was involved eith the Farallones Institute’s Integral Urban House back in the seventies, but it sounds like you are accomplishing so much more in the way of agriculture. I am a part time San Franciscan now that I left the city, and moved to British Columbia for country living and raising children. If you got your hands on enough land you would probably do very well. Wow, I just read the piece in the Chronicle, and can’t wait to read the book. I am going to try to come to July 2nd reading – would love to meet you, come see your operation. I’m a beginning beekeeper who’s always wanted to have goats, and am so inspired by your example! Wow–I just read the piece in the Chronicle as well, and I can’t wait to read the book either. I love Michael Pollan’s work as well & you are a lucky duck to have gotten to learn from him! I work just up the hill from North Gate at EECS and am a Berkeley alum–unfortunately without a yard at this point (I live in SF). Eventually I plan to start down this path myself, when the husband and I can move somewhere with a yard–so I am trying to absorb as much as I can while I am still in the planning stages! ariane: cool! see you there. Just found your blog and love it. Do you send out blog updates or do we need to bookmark you and check ourselves? Have you seen this 1976 article about the IUH? Novella, I just finished your book. I enjoyed it so much that I allowed myself only a chapter a night and I was so sorry for it to end. I had to jump online and find out if Ghost Town Farm still exists… or is it replaced with condos? My heart aches to think of such a thing. We’ll be seeing you this Thursday night at the L.A. central library for the Aloud program. Thank you for the wonderful gift that is your inspiring story well told. Tried sending an email message to your contact email and it bounced back, so I thought I would try this route. I am enjoying reading your book. I am a freelance writer here in the East Bay and write frequently for Oakland Magazine and The Monthly, among other publications. Have you been contacted by either of these two magazines regarding an interview? If not, I would like to chat about pitching your story to the editors. Look forward to hearing back soon. I have a suburban garden outside of Seattle in downtown Kirkland and expanded it this year by cutting half our front yard. It seems like more and more people are getting back to some family food production in and around the Seattle area. It is really neat to see vegetables and chicken coops sprouting up and I think your book will help inspire people to do more–goats, bees, and other ‘bigger’ projects. You are expanding the possibilities of farming in urban spaces by experimenting with growing meat–I think it would be fabulous if we saw more ‘Harolds’ roaming the streets around town. Thanks for sharing your experiences–it is fun reading about someone else’s experiences in the garden and urban farm! You are extraordinary. Farm City is a gift. A current undergrad student in St Louis, MO– your works and words inspire me to shovel, plant, share, dig, create and involve others. I would love to visit you, laugh and learn from you and your grass roots and sweet fruits of labor. I just finished reading your book, and made my husband read it too! We both really enjoyed it, and today we stopped by the farm to see how it was doing. Even though the book ended on a note of uncertainty, we knew it must still be around because we’ve eaten one of your goats, which were not mentioned in the book. It’s inspiring to see someone living such a purposeful and respectful life. Sometimes we dream of having chickens and goats, but so far I’m just trying to keep my veggie garden maintained and productive. I’ve often wished I could hire a farmer (not a gardener) to help me get the most out of our back yard. I’m sure there are others like me who have some means but not a lot of time to tend to a farm. Are you familiar with the MyFarm group from SF (myfarmsf.com)? Do you know of any urban farmers in Oakland who might be interested in such a thing? The concept of distributed urban farming seems so compelling. Anyway, thanks for the great book and blog. We’re rooting for you over here in East Oakland. there is a group in oakland/berkeley, called All Edibles. they install edible landscapes/raised beds, and harvest for you (if you want). i’ve only heard good things about them. I just want to apologize for that last comment. I was taking out some bad feelings from the day on your page. That was really stupid. it’s a weird world we live in. we snuggle up with cats, then blithely eat a pig without thinking about it at all. i do snuggle and love my farm animals–which are not pets, they are always clearly for the table–and then enjoy them when it comes time to harvest. this way they have the best life possible, and i get to enjoy the best meat possible. what’s wrong with that? sorry you were having a bad day–if you read my book (available widely in libraries) it covers more of this paradox in detail. We had lots of trouble with the issue of eating the animals with our daughter, when she was younger.It wasn’t that important to me so we ended up with a lot of pets at one point in time. The eagles, and a loose dog (not ours) killed the chickens , the ducks were also killed by a dog.The rabbits died of old age (very sad ). Finally the geese, and goats made it into meat. For PETA-types that isn’t the issue, but everyone has a right to be vegetarian, or not , as they wish. The PETA types are somewhat violent extremists. I heard part of your interview in Sacramento on CAPRadio yesterday. Just wanted to let you know that I have designed a back yard chicken coop that can be expanded as your flock grows. I hope it will help make it easier for people to keep chickens. Please take a look at creativecoops.com. Thanks. I am a twenty two year old college student, an organic farmer, and a farmstand owner. I started a small farmstand two years ago and everyone has tld me that this wil be a good future for me! I enjoyed reading your bok, choose it for a book project. I am so proud to be able to teach my class the real joys we experiance in any knid of farming small and large! You hae inspired me to be greatful for the land I live on, the hundred acres, sorry to rub it in! Thank you so much for making people more AWARE of being able to feed ourselves in America for America. LOVE your book! Took 3 days to read, now I’m giving it to my friend Joyce who raises goats ( I live on goats milk yoghurt that I make from her milk). I’ve done a few crazy things in my life, my latest adventure was in Costa Rica where I made essential oils and hydrosols on my own little finca and bottled the concoction ( insect repellent) , did my sales pitch in spanish (I KNOW I sounded hysterically funny) and sold it to the reserve in Monte Verde as well as the German Bakery in Arenal ,souvenir shops, and Moshe’s Pizza Shop in Arenal! This spring I’m starting a 12 acre farm on borrowed land in West Tisbury Martha’s Vineyard where we live most of the time. I have a successful herbal business I think but my accountant still offers me food stamps so I guess wealth is in the eyes of the beholder. A thought about Sheila….I’m thinkin’ she got you away under ANY excuse “the equipment is down” because she didn’t want to run the risk of a “piggy mommy” changing her mind at the last minute, lunging toward the executioner, putting lives at risk? ?Maybe she’s seen this kind if thing before…in some way, anyway I would be curious about her side of the story. It reminds me of when I cried ( as did other mommies) when our children first went to kindergarten, the teacher coudn’t wait for us to leave and inferred we were in the way, the mommies that have a hard time letting go. Now our children were’nt actually being slaughtered but change is a kind of death and it is hard to let go. My daughter is in college now, my 2 kids grown up and I’m only 41, plenty of time left for farming….!!! Awesome book, thankyou so much for all your funny and intimate stories, you will help many people to “be themselves”. Another thing, you are such a good writer, the $ probably aren’t in the farming production part, keep writing articles for $ , but also keep up your adventures to write about! PS my website is http://www.skyebotanicals.com , I also make a lot of medicinal tinctures. I started this path at Esalen Institue Big Sur when I was 19 , and have lived in Cape Breton Nova Scotia as well as Martha’s Vineyard. Anyway, it’s the new year and my second year of gardening and while I don’t want to bit off more than I can chew (I’m expecting a second child in April!) your book has showed me what is possible long term which is really exciting to contemplate as we settle in. One question: I am trying to get an idea of the size of your plot and how it compares to ours. While we are a bit in the “burbs” ourselves at the same time I think we can do a lot more with our yard than I thought. Am I remembering right that your plot was only 4500 feet in Ghost Town? I like to tell stories, too. Am anxious to read your book and attend the “Write in the Woods” workshop in May. I just finished your book…it was wonderful! Just wanted to say thanks for sharing your story. It gives me hope for my gardening efforts on my .17 acre lot in a small city. Hi Novella. I just finished reading your book. I wanted to let you know that I loved it!! You have a wonderful writing style. It was a lot of fun to read. I don’t know anything about farming but I am very interested in food/food policy – especially how our food choices have environmental and health implications. Congratulations on the success of your book and your farm (and your blog/website is great)! I first heard of your book when I read an excerpt of it on the NPR website and found that I really enjoyed it. I would love to see your farm one day (are you ok with people coming by to take a peek? I want to ask just in case you are getting a ton of visitors now with the success of your book and you want some privacy!). I am definitely recommending your book to my friends and colleagues. Your story is very inspiring! I’m happy to see there are people out there who follow their passion. Thanks for sharing your story with us. I live in the SF Bay Area and was wondering if you will be coming to a bookstore for a book signing/reading in the Peninsula any time soon? Thanks! Wanted to drop you a line and let you know how much I am enjoying your book and how inspirational I have found it. I am a secret backwoods kinda girl- have been for years- as I age (40 now) I am finally doing things I had thought about. My next big project is trying to change the zoning in my small town (Cecilton -7 miles south of Chesapeake City, MD- just a short hop across the bay from Baltimore) to allow chickens- the silliest thing my small rural town has zoning against chickens- I would like to just be a rebel and just get them- some people in town do, but I am chair for the planning and zoning. Wish me luck and any suggestions would be welcome. thanks jc! i’ll be reading in morgan hill on feb 27th at their big library…i do prefer that people come during an open house instead of dropping by…thanks! kristie: there’s a movie called mad city chickens that is good to screen in towns with dumb laws that ban chickens. it’s inspirational and really funny, too. i’ll be in baltimore this summer, hope to meet you. Let me know when your coming to Baltimore- my hubby is a baybillie, we might be able to work out a crabbing adventure! Just saw your one-page piece, Milking Time, in Eating Well Magazine—I had to read it twice I enjoyed it so much. I am a city girl originally from NJ and can envision your farm. Looking forward to your book. You go! Love your book, love your concept, remembering my life (I am more your mom’s age!) urban farming with rabbits, ducks and an organic garden some 30 years ago! Thanks for the memories, and for reminding me that there are others to carry the torch now! Novella I’m currently reading your book and found your video from Chow on Youtube. Love the book and identify with you. I grew up on a farm even though my dad had a “real job”. His love of land and animals I hope passes through me on to my children. We are priveledged to be able to eat beef he has grown. I will always have a garden even though most of my suburban friends think its weird. (I think it’s weird to ever eat a tomato bought from the grocery store! ick!) Just wanted to say thank you for sharing your life with the rest of us. I just finished reading your book last night and absolutely loved it. As an “urban container farmer” with exactly three wilting tomato plants that aren’t thriving in my yard, I was totally overwhelmed by your farming prowess, [while managing to find time for many other lives in the process of creating your wonder world.] Nothing but astonishing. Thanks so much for sharing your life and knowledge! Love the book! I got it from the library yesterday and devoured it in one sitting. I love the honesty of your writing, your willingness to include your failures as well as successes. I live in downtown Toronto and grow as much as I can, on the roof and in a small backyard plot. Last year a possum nipped every squash off the vine and stripped my tomatillos bare- if I had caught him I might have dealt with him as you did but he is still out there waiting for this years bounty I’m sure. I haven’t graduated to any animals yet but I’m hoping that the city will allow backyard chickens soon! We harvest fruit from public spaces and residential properties, with 1/3 going to the homeowner, 1/3 to the volunteer pickers ( known as gleaners) and 1/3 going to local food banks and community kitchens. Last year in just three neighbourhoods we managed to harvest over 8000 lbs of fruit that normally went to waste. We also created canning projects to preserve some of the harvest. Most recently we did a pilot project that saw us tapping maple trees and making maple syrup right in a down town park! Looking forward to reading updates on the blog! I’m halfway through your wonderful book. It reminds me of “Enslaved by Ducks”, by Bob Tarte. The characters in the book also fondly recall the people I knew during my years living in San Francisco (1976-81) when I was an art student. There were a lot of Lanas! Like you, I studied journalism. I worked steadily as a reporter for a number of years before ending up in north San Diego County on 10-acres of rural property where my husband and I have started an art school for children (Carlsbad Art Farm). We teach kids to draw and paint using live farm animals as models. Thank you for sharing your wonderful world with us readers! Do you ever worry about the City coming to you and giving you a hard time (other than the recent fire marshall incident)? I’m always hesitant about giving too many details online, including just my street because I don’t want my City coming to us and telling us what we can’t do. I just finished your book and am feeling very inspired. While I am a vegan and do not expect to start raising rabbits, pigs, or meat birds, I sincerely respect how you raised them start to finish and wanted to be a part of the butchering process. I appreciate the hard work and humor that went into your development as an urban farmer and am pleased that you would share your experiences with those of us who are still searching for who we are. thank you dave! it really means a lot to me to hear this from you. keep up your good work, and get growing some lettuce, kale, or carrots! you’ll be amazed how good they taste when you grow ’em yourself. Hi Novella! I saw you speak at the Arlington (VA) Central Library a while back, and I just finished your book. I loved it! Thank you for eating ethically and writing about it so appealingly. I’m an occasional carnivore (farmers market chickens), and I would (happily) eat what you’ve raised happily. Love the goats, want to know about the next open house, about to buy the book. Live in Oakland, too. Mostly natives front yard bee, bird, and butterfly garden. Vegetables and some fruit in back, which husband Brad has taken to growing, seed saving, drying, freezing, pickling, and canning. Go, Brad! Novella – Loved you book & am hugely inspired to have my own urban farm. Thanks! Just starting out – your book lit the fire!! Novella – Just had to tell you that I LOVED LOVED LOVED your book. It tastes of home. I’ve lived in the East Bay for years and laughed out loud when you mentioned tumbleweaves – I’ve seen them on San Pablo. And when you mentioned dumpster diving for loaves, I knew just which dumpster you were referring to, having partaken of the same bounty before. Thank you for doing everything that I’ve only dreamed of doing, and sharing your rich experiences. And congratulations on the purchase of your lot! I think that people eat meat a lot and don’t really think about were it comes from or how difficult the process of raising and killing the animals is. I also had a few questions… I was wonderin 1. whats your favorite animal you’ve ever had? 2. what’s your favorite type of animal? 3. what is your favorite type of Meat? 4. what animal were you saddest about killing and eating? 5. what is your favorite animal you have now. Novella, I recently read (er…listened to) your book (the audio version) and I enjoyed it immensely! It made my walks too and from work rather entertaining. I especially loved hearing all the details of the charcuterie. I will have to poke around here and see what has happened since the book ending! I won a copy of Farm City from a blogger here in Maine. It was used before she got it and I sent it on to my sister in law in Chicago. She’ll be sending it on to some other deserving person who wants to be more self reliant. I love your story and just bookmarked your blog. Novella, I just got 6 little chickens and was given your book as a gift. Wow. What a gift it is. I have a sneaking suspicion that I will soon be my own version of you. Will have to buy copies of the book to give away as I won’t be able to part with mine. We could change the world with something like this. Thanks for sharing your large experience. Life is too short not to live it like this! So…I think I’m gonna have to read your book. I first came across you in last November’s issue of Food & Wine. I tried a couple of the recipes from that story (which were good) but was more fascinated by the tidbits regarding your urban farm in Oakland. I thought of you again this weekend after my husband and I looked at some property on the outskirts of Houston. Not a very large amount of acreage compared to Texas, but quite a bit when compared to the inner city. I mentioned your farm to my husband (again) which he happened to remember (big surprise). So I had to dig out the magazine and figure out who you were so I could google you and come up with some visuals of your tenth of an acre. So far I have found it fascinating enough to blow off my law school homework for the entire evening and dream my own little dreams. But now I really have to read your book. Which I really shouldn’t have time for…because the bar is looming ever closer. Novella – I’m a fan. You’ve been discussed in our gardening class in Urban/suburban Ohio. I’ve recently added chickens and want regular updates. I have conference jealousy but alas the pleasures of a 2 year old don’t allow. Be well and blessed by the farm! We want to do what we can to help. I absolutely loved the book and wanted to see you at Cuesta tonight but couldn’t swing it. My friends are going without me and I am at home looking at your blog…bummer. I asked my best friend, Tonia to invite you to dinner at my house and she assured me that she would. Don’t think we’re crazies (maybe a little) but I just thought you might enjoy a home cooked meal and some good girl farming talk while you’re on the road. We are here in Paso Robles on a vineyard and the kitchen is open! I would like to subscribe to your blog for email updates, but can’t find the link. Keep up the great work. I loved your book. Best regards. I had the unexpected pleasure of sitting across from you at a fantastic Tartine After hours meal – it was the really hot, summer night….so fantastic that people were still hanging out sitting on the hill in Delores park as if they were watching a movie – but they were just hanging out enjoying the weather & community! I LOVED your book – thank you! Thrilled to find your blog/website & learn & support you in your plight. The Education of an Urban Farmer and it is awesome. You paint such vivid pictures with your words and you language is so fluid and natural. Even after a 13 hour car trip we didn’t want to get out of the car as we are learning about the fate of the “piglets” at the hands of the crazy women. You are a superb example of being passionate. Keep up the great work!! And good luck with everything. I just finished your book today and I wanted to personally thank you for inspiring me to grow my own food and feed my family in a thoughtful, thankful way. I look forward to seeing what else you do and what else you accomplish. Thank you! Okay, this is my first blog experience EVER!!!! My dear friend Kate, who is a Chicago girl and makes some of the most fabulous handcrafted soap on her farm in Moscow, Idaho, gave me your book to read. Two weeks ago I was working her booth at the art festival in Spokandy, as we like to call it now due to a cheesy candy store in the downtown area, I met a fabulous guy, that at first look took my breath away and we had two dates that weekend and found that this is worth the time exploring, one thing though, he lives in Oakland. So after two weeks of texting and talking I find myself in Oakland for a week EXPLORING! I’ve been reading your book and just adore it! I think I’m on chapter five, Lana and Bobby are arguing in front of her warehouse and she just threw the television. LOL! I love it! Now that’s an entertaining neighborhood! I’m in search of your farm. I am so into the idea of urban farming! I’m visiting from Moscow, where I currently work on the WSU organic farm and absorbing as much about farming as possible. I’m a cit boy at heart and Moscow is my first adventure into the rural. I truly love it there, such a fabulous community, but a I find myself itching for a city again. I’m heading to the big island of Hawaii for a farming adventure, farming and the beach, gotta love it! So after my adventure, if I do return, I am so interested in the Urban Farming, having the two things you love in the same place. Who says you can’t have your cake and eat it too. The culture and fabulousness of living in the city and doing what you love to do, farming! You are truly inspirational. Such a great attitude and adventurous spirit! When living in the city, I’m always in the edgy neighborhoods. So looking forward to seeking your farm out and getting photos for my girl Kate and maybe run into you and have a chat. Sincerely, Idaho Mark, “Who da ho? I da ho! Okaaaay! lol! Hi Novella – I just closed the back cover of Farm City and loved it so, so much. My husband and I are Muslim and working on a project to bring these kinds of community-oriented food ethics and especially meat-sourcing into our community (at http://www.beyondhalal.com). I wish we had a garden, or access to a garden, but we live in a brick shoebox in an apartment building with not even a patch of sunlight to grow anything but mold, though we’re getting into mushrooms in the highly underutilized space in our fireplace. I’m looking forward to the day we’ll have our own animals and a whole community in orbit around our garden. It’s really inspiring to read about you in action, and I’m sad (though totally get) that you’re not blogging here anymore. Seriously, I can’t wait for a sequel! Thanks for the book and great work! Wanted to let you know about a great new resource in Berkeley for easily mapping publicly accessible edibles. There are a number of similar efforts in Portland and LA but this is intuitive and can’t get any more local. Please give us any feedback you might have. Ghosttownfarm – Thank you SO much for the inspiration! I grew up on a very small 5 acre farm that my (also) former hippie parents worked. Now that I live inside Tulsa, OK city limits, I have become less and less connected with my farming roots. Your book has rekindled my love of farming, and I am now working on making my lot-and-a-half in the city a FOOD garden, rather than an ornamental garden. I am now seriously looking into raising urban chicken and rabbits for meat! My mother is less than excited, but still supportive. 🙂 Congrats on the baby! http://insanityofmotherhood.com/2012/05/19/one-lovely-blog-award/ Hello. I have nominated you for the One Lovely Blog Award. Congrats! Do you only publish complimentary comments? The fact is, the majority of people don’t want to live anywhere near rednecks who slaughter animals and I know many have made comments on this blog to that effect. Your blog, so I guess you can do as you wish, but what are you afraid of? Comments are comments, are you too delicate to take a little criticism? I follow blogs I enjoy- I may not do or always agree with the things bloggers do, but I enjoy them sharing their experieinces with me. Novella thank you for taking your time to share yours with me. nope, i let them fly, never edit or delete (unless they are spam). check out the rabbit entry for some amazing conversations. We’ve been keeping bees for 5 years and give most of the honey away. Is Novella Carpenter your given name? Congrats on the article about you in the recent issue of Sunset Magazine – Way to Go – love your approach on urban farming and the risks you take to have an urban farm!!! I have instead? Many people have criticised the elimination of grains, which are 100% range-fed buffalo meat. I just finished reading your book and loved it! Very inspiring and well read. Glad to have found your blog and will be going through it as well. I’m going to plant a wee container today with my daughter and see if we can grow some veggies….thanks again for the great book. I wish I had read the book years ago as I could have helped with the butchering of rabbits, chickens and turkeys I’ve been doing this for years and I love eating my own food. Of course I also shop for my food. Just enjoyed a video about you on Youtube. Giggled out loud a few times. Love your relaxed, realist outlook. Writing to you from a wannabe farm in France. My husband makes wine and I’m busy littering the back yard with toilet paper rolls. This is not Versailles, I tell visitors. It’s called permaculture. I’m learning. Just recently discovered your book at my local library while hunting for some gardening inspiration. I’m only on page 38, but had to stop to hunt you down – Girrrrlll – you are an awesome writer! I am enjoying it so much; I’m ready to run outside and tear up the yard of my apartment…except is 19 degrees outside. Anyway – just wanted to say you are a great writer – will be looking for other books from you! Thanks so much – and keep up the great work! Currently listening to your Farm City book. GREAT book! All of your experiences and thoughts are what I am currently going through -chickens, Bees and gardening love it! and I was like you, learn about engineering, but the plunge in agriculture..
My name is Viktoria and I’m a student of city college. My English teacher Andrea Satellite picked your book “Farm City” as a class source and she gave us some of the questions by your book. But I want ask you, if you have a free time for me, I would like to interview you with those questions. And how said my teacher all of us would be interesting to hear what Novella Carpenter think about. If you have time for me and would like to help a student who is a beginner at gardening please email me back. Our assignment is due day on coming Tuesday, I’m free any days till. But I would love to your farm even today. I finished reading your book during the night. I have read it slowly savoring every part of it. I loved reading your stories and enjoyed discovering we had some things in common. Today I decided to try to find your blog and was glad it was so easy to do. I look forward to reading more. I was wondering what ever happened to Chris Lee from the restaurant Eccolo and if you ever figured out a gift for him.